Dental implants can make a big difference in your life if you have missing teeth to replace. Dentures can be challenging after a long period of wear. If you have dentures made from plastic and cast metal, you may have experienced irritation to your gum tissue. Denture wearers may experience slippage and movement while talking or eating. Dentures need to be replaced every five to seven years and can also contribute to the damage of your bone and facial structure if worn too long. If you are ready to find a dentures alternative, you can make an appointment with Dr. Giamberardino today. Dr. Giamberardino is an experienced dental implant dentist. Dr. Giamberardino and his team at proudly serve patients throughout Medford, MA, Winchester, Somerville, Malden, Everett, and surrounding communities. Natural– Dental implants are actually tiny titanium posts. Titanium is naturally compatible with the human body. Comfort– Dental implants are surgically implanted into your jaw bone. As the implant heals it will fuse with your jaw bone which creates stability and prevents slippage. The stability makes it easier to chew, bite food and speak confidently. Versatility– Dental implants can be used in a variety of ways to replace one tooth, an implant supported bridge, or an entire set of implant supported dentures. 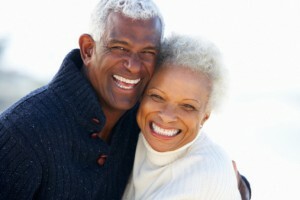 Long Term Results– Dental implants can last a lifetime with consistent oral hygiene. Bone Stabilization– Each of your teeth is surrounded by bone which exists entirely to support your teeth and facial structure. When a tooth is lost, the bone surrounding it will cease to have a function and become reabsorbed by the body. Dental implants can prevent this bone from reabsorbing and preserve your facial bone structure. Dental implants can enrich your life in many ways. No matter how long you’ve depended on dentures to replace missing teeth, it’s never too late to consider dental implants. Make an appointment with Dr. Giamberardino for your dental implant consultation. The sooner you start the implant process, the sooner you can enjoy the benefits of dental implants. Dr. Giamberardino restores smiles daily throughout Medford, MA, Winchester, Somerville, Malden, Everett, and nearby areas. Comments Off on Is It Time to Get Dental Implants?